While search engine optimization (SEO) and social media might seem like strange company, there are connections between the two, and there's strong evidence to suggest that Google is making progressively more use of social signals such as likes, retweets, comments and other forms of engagement in their ranking calculations. What do we really mean by the term “social media marketing”? Marketing is a conversation that takes place between ourselves and our target market, as opposed to the more traditional interruption model of advertising, and social media can add great value to our marketing by making it much easier for that conversation to take place. Social media marketing builds real human relationships online, something that many people seem to forget in the race to “get more followers, like, and fans”. Social media marketing is not a replacement for other forms of marketing, nor is it meant to be your entire marketing system. The social networks are tools to be included in your overall marketing toolkit, but don’t be tempted to put all of your marketing eggs into the social media basket. For example, consider how Facebook has evolved over the last few years. Every time they change something, there’s almost a revolt from the people who preferred things the old way or who have privacy concerns. In 2012, Facebook changed the ways that content posted on fan pages is shown to the people who “like” the page, resulting in the situation where less of our fans see our updates and we’re forced to consider the paid option of promoting posts that people should already be seeing anyway. That one change alone has meant that more businesses are using Facebook pages less and less in their overall marketing strategies, and working at building better quality relationships with their audiences instead – something that can be tough for a big brand to achieve without significant manpower, which gives the small business owner a distinct advantage. The quality of your social media marketing interactions is obviously important based on what we’ve said so far, but what about the quantity of social media contacts? Is it really essential to attract hordes of Facebook fans or Twitter followers? There’s no simple “yes or no” answer to this question, as there are many factors at play, and the true answer depends on who it is you’re trying to reach, and in what geographical area, plus how thinly you want to spread your message. After all, if you have thousands of Twitter followers, there’s likely to be a very low “signal to noise” ratio in the interactions you have because not all of those people will be from your target audience, and many of them will be actively engaged in targeting you as their market for something they want to sell. That said, there is an advantage in being able to reach the appropriate friends of your friends, or the followers of your followers, to further expand your reach. Both quality and quantity are important, but some effort is required to identify the higher-quality and more productive relationships. Therefore, encouraging your social contacts to engage with you through direct email marketing is one excellent method of distilling your multitude of social connections into something where you feel you can have a more personal interaction with them. 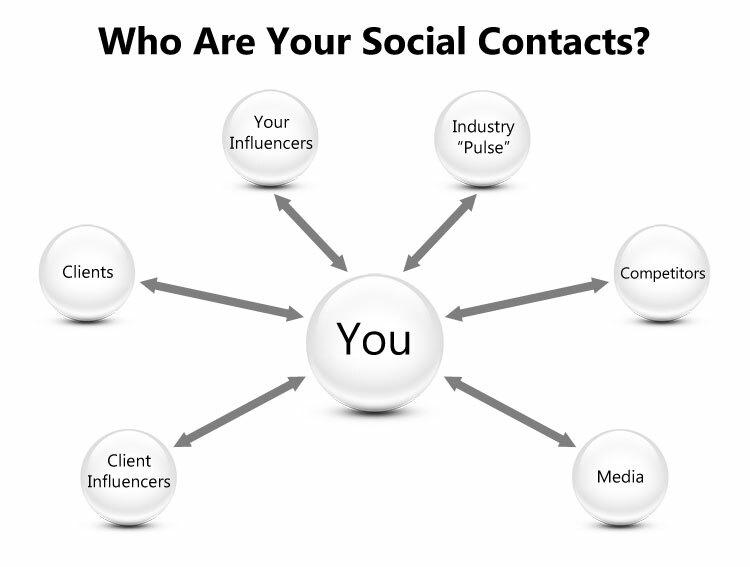 Who Are Your Social Contacts? This is a question that every professional photographer should ask themselves before embarking on an extended social media marketing campaign. For the most part, the answer will be very similar to the question “who is your ideal client” but with some notable and important additions. As you can see from the simplified diagram below, your business social network is quite complex, and is not only made up of your clients and customers, but other important people too. Here’s a quick breakdown of these six main groups and how they fit into your social network. Obviously, your customers and clients should be in one or more of your social networks and, as previously noted, your choice of active networks with respect to your clients will be somewhat dictated by where they’re the most active, and the type of photography services you offer. Some of the social networks have ways to segment contacts, so make use of those where possible to help you distinguish your clients from your other contacts. For example, Twitter and Facebook both have “list” features and, of course, your Facebook fan page acts as a list in its own right. Journalists, bloggers, and other media representatives can be very useful assets in your social network. They can help identify interesting and trending topics in the news that you can share with the rest of your audience, and they can even act as channels to share your message with the rest of the world if they find it compelling enough. Make friends with and follow your local TV and radio personalities, for example, many of whom are more than happy to connect with you on social media. Bloggers, of course, are excellent sources of material to share with your network, and may also provide you with guest blogging opportunities to help with your search engine optimization and perceived authority. These are the people who have an influence over your personal and business development, for example. They can be noted industry and market personalities, respected thought leaders in their field, or simply people whom you admire and look to for inspiration and motivation. Likewise, there are also those who influence your clients. This is where getting to know your target market in as much detail as possible is valuable and provides useful intelligence about the kinds of ideas that inspire and motivate them. For example, discussions centered around the people, events, and ideas that your clients naturally become excited about will help create common ground in your marketing conversation because people like to work with people they like, and who are like them. The first instinct with this class of social connections is to think of it in the sense of “spying on the competition”, but that’s not the most important reason for connecting with other photographers. Most of the people in our industry are more than happy and willing to help each other learn more about the technical, business, and marketing aspects of being a professional photographer. It makes sense, then, to join groups and forums with other photographers, as well as connecting personally. You never know when you might run into a problem and need the help of another friendly local photographer. For example, if your assistant falls sick on an important wedding day. With a few calls to your local photographer network you can probably find a replacement within a short time. The last social benefit I want to highlight here is that of keeping your finger on the industry pulse, as it were. Things change fast in the photography business, and news spreads first on social media, so keep on top of what’s happening through your social networks. It’s taken more than a few years for the search engines to start using social media signals in their ranking calculations, but they’ve now caught up and social media is now as much a part of SEO as keywords and standard website links used to be. Links are still considered as the main currency of SEO, acting as votes of confidence in your website content, but social media links (+1′s, shares, tweets, pins, and comments) might soon carry even more weight because they offer a more accurate view of how real people feel about what you have to say. Essentially, the more your content is shared in a social environment, the better off you’ll be in the race to claim authority on your topic. Expect to see a lot more on the concept of authority, by the way, as Google Plus and “author rank” become more important in measuring the social networking impact of our content. If you’re not making the most of Google Plus at the moment, then it might be time to reconsider your social strategy to include it. One of the big questions is “which social networks should I be on?” and it can be tempting to try to use them all, especially when we see other photographers jumping on to the latest newcomers, such as Pinterest. However, it’s not feasible for us to be active on every social network at once – at least not if we want to get any real work done! The best answer is to pick the most relevant ones for your target market, and maintain a low-key presence on others that might benefit your SEO. Generally speaking, Facebook and Twitter are also good places for most photographers to be active. Pinterest is proving very useful for wedding, portrait and fine art photographers, while LinkedIn is probably better for commercial photographers. Whichever networks you choose, it’s important not to spread yourself too thinly, and be mindful of how much of your valuable time you spend on there. All of the social networks provide a profile for their users, so be sure to complete them in as much detail as possible, and keep them consistent across networks. It really helps, for example, to use the same profile photo on all of your social media profiles to help with brand recognition. To get the best return from social media for SEO purposes, a high level of audience engagement is important. Make sure you use the appropriate social sharing buttons on all of your content, and give people a reason to share or comment on your website or blog. Don’t forget to ask your readers to share your content with their friends, and you might even come up with creative strategies to make sharing both fun and rewarding. The key aim here is to get as many shares, “likes”, tweets, +1′s and pins as possible to help spread social links to your content far and wide. But – don’t forget the social part of social media – acknowledge your readers’ comments and respond to any questions in a timely fashion wherever possible to keep the circle of engagement going.